Multiple blood transfusions are a fact of life for some patients with leukemia, lymphoma and myeloma. Transfusions are used to improve blood cell counts and to treat the signs and symptoms of anemia -- such as fatigue, foggy thinking, shortness of breath and weakness. However, multiple blood transfusions over time can potentially cause iron overload – a condition that, if untreated, can damage the heart and liver. Iron has a very important role in our bodies. It plays a part in many biological processes, including the synthesis of DNA when cells divide, and the transportation of oxygen from the lungs to our cells and tissues. Iron that we take in through our food generally binds to a protein called transferrin and circulates around in our blood plasma. For the most part, this iron is used to form hemoglobin, the substance in red blood cells that transports oxygen that we breathe into our tissues. Leftover iron is stored in the liver, for future use. The human body does not have the ability to purposefully remove or excrete excess iron, although some iron is lost in normal processes such as the shedding of skin cells. Once the body’s maximum iron storage capacity is reached, iron begins to build up in other parts of the body, leading to iron overload. Red blood cell transfusions deliver a very large amount of iron. In healthy individuals, only about 1-2 mg of iron is turned over in a given day – that is, iron that’s taken in from the diet and lost through the shedding of skin cells and gastrointestinal cells, for instance. A single unit of packed red blood cells (PRBCs), however, contains about 200-250mg. Most often, patients receive two units each time they are transfused, so that’s an extra 500 mg in just one day. When iron has overwhelmed the body’s ability to safely store it, it can cause harm in a number of ways. First of all, when there is more iron in the body than transferrin for it to bind to, it circulates around by itself as non-transferrin-bound iron (NTBI). This form of iron is toxic to our bodies, and causes damage to our tissues and organs at a cellular level. In addition, excessive iron accumulates in the heart, lungs, brain, endocrine glands, liver and even the bone marrow. Some evidence also suggests bacterial infection may be one of the consequences of iron overload. People who are at risk of transfusional iron overload are those who have received many transfusions of red blood cells. Adults who regularly receive transfusions are at risk after about 20 lifetime units of PRBCs, or 10 transfusions if you get two units at a time. Patients with blood and marrow cancers, such as leukemia and lymphoma, usually require a greater number of transfusions after chemotherapy, after radiotherapy to their pelvic region, or following stem cell transplantation. Patients with myelodysplastic syndromes (MDS) often have a persistently low hemoglobin and many are transfusion dependent, putting them at high risk for iron overload. MDS with sideroblastic anemia may also cause patients to absorb an excessive amount of iron from their food, making the problem even worse. Iron overload occurs over time, and often patients will not show any signs. It is more likely that iron overload will be detected by laboratory results before the person has symptoms. The most common test to assess iron saturation is called serum ferritin levels. This is a blood test that may be done on a regular basis for high-risk individuals. Serum ferritin levels increase as the amount of NTBI increases in the blood. Blood ferritin levels that are greater than 1,000 mcg/L indicate iron overload. Healthy men usually have a serum ferritin of 24-336 mcg/L and healthy women 12-307 mcg/L. Other diseases and conditions can also cause large amounts of ferritin to be released in the circulation, however, which can make a single elevated reading unreliable, so testing on a regular basis is the norm. Physicians may also choose to do a liver biopsy to check iron concentration. While this test may give slightly more accurate results than serum ferritin levels, it requires a fairly invasive procedure that can lead to complications, such as infection and bleeding. Biopsy results greater than 7 mg iron per gram of liver indicate iron overload. Imaging studies can also reveal findings suggestive of iron overload. Magnetic resonance imaging (MRI) may be used to detect iron accumulation in the liver and the heart. MRI may be used together with liver biopsy to diagnose iron overload or independently. However, iron deposition is not reliably predicted by MRI in some instances, such as when iron deposition occurs in the pancreas. There are two main ways that iron overload is treated: therapeutic phlebotomy and iron chelation therapy. Therapeutic phlebotomy is the quickest and most effective way to get iron levels down in a patient. Unfortunately, it cannot be used on patients that remain anemic. Therefore, it is typically reserved for patients whose leukemia or lymphoma is in remission. During a therapeutic phlebotomy, a nurse or doctor will insert a large needle into your vein, usually in your arm. They will then remove about 500 ml of blood from your body over about 15-30 minutes. If you have ever donated blood, you get the idea. This amount of blood contains about 250 mg of iron. As this iron is removed through your blood, your liver releases some of its stores and eventually the amount of circulating iron can be returned to normal ranges. Phlebotomy may be done once or twice a week as necessary to reach the goal of serum ferritin levels of 50-100mcg/L. Iron chelation therapy uses medications that bind, or chelate, iron and facilitate its removal from the body. The goal of this type of therapy is to remove excess iron from the blood and organ tissues. Although this therapy works well on plasma iron and liver deposits, it is not as effective in removing iron deposits from the heart. Deferoxamine (Desferal), deferasirox (Exjade), and deferiprone (Ferriprox) are three such medications. Iron chelator medications are effective at reducing NTBI levels, but these levels rebound quickly if the therapy is discontinued. Therefore, these medications must be taken exactly as directed for them to work properly. This can be a big commitment for some patients. Iron chelators are also not without side effects, and the risks and benefits of iron chelation need to be weighted carefully. In addition to these therapies, your healthcare provider may make recommendations to lower the amount of iron you absorb through your food as well. While this is a measure that makes sense intuitively, with a few exceptions, the benefits of restricting iron in the diet are questionable since this approach suffers from the "drop in the bucket" phenomenon, and since treatments for iron overload such as phlebotomy are far more effective at reducing iron levels. Blood transfusions are often a necessary and effective component of leukemia and lymphoma treatment. Anemia can have very harmful, even deadly, effects on your body and transfusions may be unavoidable. However, there are things that you can do to ensure that your iron levels are monitored properly. 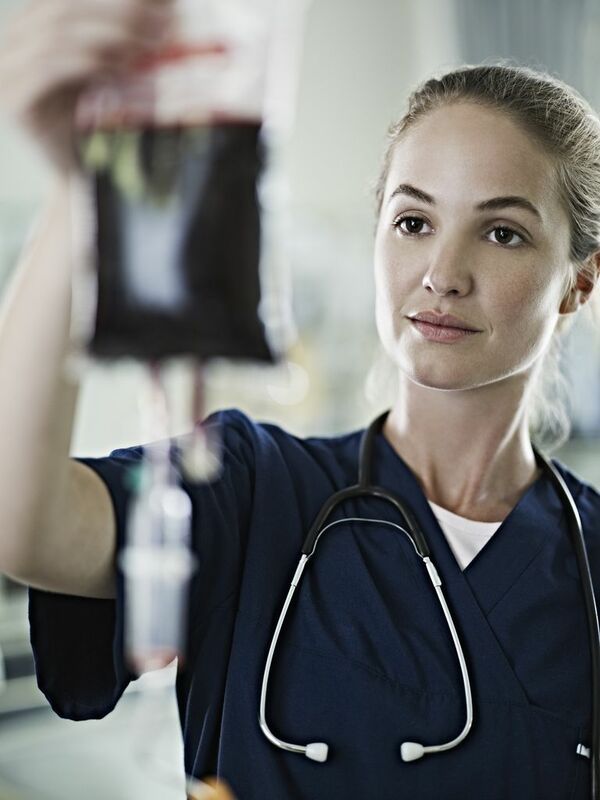 Ensure that your current healthcare team knows all about your past blood transfusion history. You may have received PRBCs years ago for a completely unrelated condition, but your doctor needs to know about that now. Remember that iron has no way to be excreted from your body, so each transfusion you receive in your lifetime has the potential to contribute to iron overload today. You should also try to keep track of each transfusion you receive. This may not be easy, and there may be times in your therapy when it seems like all you do is get transfused, but it will be important later on. Your healthcare team should begin to monitor your serum ferritin levels once you have received about 20 lifetime units of blood. If you usually get two units at a time, this may only be 10 transfusions. If they do not automatically order it, you should request it. Patients who receive a number of blood transfusions in their lifetime are at risk of developing iron overload. Due to the nature of their diseases, and the therapies used to treat them, blood and marrow cancer patients are often transfusion-dependent for a time. If untreated, iron overload can lead to serious organ damage and even death, but effective treatments are available. While it may be impossible to avoid blood transfusions, patients can help to protect themselves by being mindful of the number of units they are receiving and requesting iron overload testing if necessary. Brittenham GM. Iron-Chelating Therapy for Transfusional Iron Overload. N Engl J Med. 2011;364(2):146-156. Zhang C. Essential functions of iron-requiring proteins in DNA replication, repair and cell cycle control. Protein & Cell. 2014;5(10):750-760. Geissler C, Singh M. Iron, Meat and Health. Nutrients. 2011;3(3):283-316. Karimi M, Jamalian N, Rasekhi A, Kashef S. Magnetic resonance imaging (MRI) findings of joints in young beta-thalassemia major patients: fluid surrounding the scaphoid bone: a novel finding, as the possible effect of secondary hemochromatosis. J Pediatr Hematol Oncol. 2007;29(6):393-8. Antle, E. Who Needs A Therapeutic Phlebotomy? Clinical Journal of Oncology Nursing. December 2010. 14: 694-696. Ault, P., Jones, K. Understanding Iron Overload: Screening, Monitoring, and Caring for Patients With Transfusion Dependent Anemias. Clinical Journal of Oncology Nursing. October, 2009;13: 511-517. What Should I Know About Juvenile Myelomonocytic Leukemia (JMML)?